Exercise doesn’t have to cause sore muscle or sore joints, but what happens when it does? Sore muscles can develop during exercise (acute) or on the day or two after exercise (delayed onset muscle soreness). Do you find yourself experiencing sore muscles more frequently than you should? The condition may be nothing to worry about—or it could be something that needs medical attention. Consider that there are two types of muscle soreness: One is called acute muscle soreness and the other is delayed onset muscle soreness. Both are a result of putting stress on muscles during exercise, but there are differences, too. Here are the details. Some people experience sore muscles during exercise. This is the acute variety, and the pain can vary from mild to severe. If it’s mild or even moderate, it’s probably normal and nothing to worry about. Severe pain that develops during or immediately after exercise is not normal, says the National Kidney Foundation. 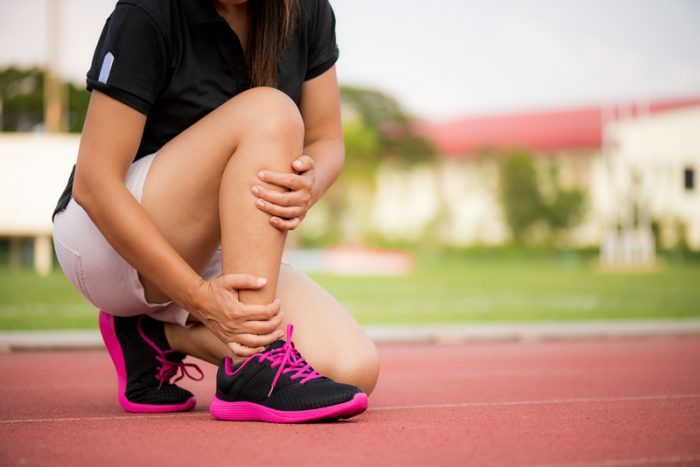 It may be a signal your body is giving you to stop the activity before serious muscle or joint damage occurs—as in a pulled (strained) muscle or a sprained ankle or knee joint. The pain is likely to be one-sided (in one specific area of your body)—not the general type of discomfort where you seem to be sore all over. Unlike acute muscle soreness, delated onset muscle soreness (DMOS) is a kind of “morning after” pain that begins 12 to 24 hours after an exercise session. The American College of Sports Medicine (ACSM) says that DMOS appears to be a side effect of microscopic damage to muscle fibers involved in the exercise. Types of exercise that are known to cause DMOS include step aerobics, jogging, and strength training, but it might happen with other forms of exercise that haven’t been included in current research. The American Council on Exercise says that those who experience DOMS include conditioned exercisers who increase the intensity, frequency, or duration of their workouts, as well as beginning exercisers or those who have taken a break from their exercise routines. Starting an exercise program for the first time. Adding a new activity or exercise to your routine. Increasing the amount of weight lifted, the number of repetitions, or the speed of exercise movements. Performing the same activity over and over again without a sufficient rest break. The aches and pains are general in nature and minor. They are a sign that muscles are adapting to a new exercise routine, and the muscle soreness goes away within a day or two—with or without treatment. How Should Sore Muscles Be Treated? Acute muscle soreness that is mild or moderate doesn’t mean you have an injury and should stop exercising. You may be able to continue at a less challenging pace or exercise parts of your body that are not sore. For example, if soreness in your neck and shoulders are the problem, walking or exercising on a stationary bicycle would be a lower body exercise option. Ice, heat, massage, stretching, and over-the-counter pain medications (aspirin, ibuprofen, naproxen, acetaminophen) can relieve the symptoms of both acute muscle soreness and DMOS, but there is no research showing that these treatments can shorten the duration of DMOS. The best treatment for DMOS is light activity and rest, according to Ryan Lingor, MD, a primary sports care physician at New York’s Hospital for Special Surgery. How Can I Prevent Sore Muscles? Eat healthy sources of carbohydrates and proteins after exercising. Progress slowly when starting a new program. Stretch only after your body is warmed up, and stretch after exercise as part of a cool-down routine. Allow muscles time to recover (resistance training for the same muscle groups only on nonconsecutive days). Muscle soreness is a relatively common side effect of exercise, but it doesn’t mean you’ve suffered an injury. Sore muscles go with the territory of exercise. The pain will subside within one to three days. If the pain is severe, interferes with daily activities, or persists longer than 72 hours, see your doctor. aches and pains, exercise, exercise program, exercise routine, exercise routines, knee joint, massage, muscle, muscle soreness, pain, pains, severe pain, sore muscles, strength, strength training, stress, types of exercise.